MEASURING Correctly is Very Important! Please Do Not Choose A Trampoline PAD Unless You have Read, And Measured According To Our Instructions! PLEASE DO NOT USE THE MEASUREMENTS GIVEN IN YOUR TRAMPOLINE MANUAL! "IF" the measurement you have DOES NOT MATCH any of the available trampoline pads, we may still have it in stock. 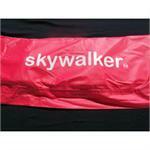 We also make "custom" trampoline pads. Please call 1-800-Trampoline, (1-800-872-6765) or E-mail us. Shipping Is Included within the Continental USA.